against the drone war, which starts daily from German soil, and the procurement of killer drones by the Federal Government of Germany. against the US Air Base Ramstein. With its diverse command structures, the Air Base is the operational, command and control authority for worldwide war operations for the USA/NATO and a logistics center for wars. It is the headquarters of the US Air Forces for air force operations in Europe and Africa. From Ramstein, war is commanded, organized and conducted. against the policy of confrontation especially against Russia, also co-organized through the Air Base Ramstein. The Air Base is the operational center for the so-called missile defense system directed against Russia. NATO troops and maneuvers on the border of Russia are also coordinated via Ramstein Air Base. Against an increasingly unbearable burden on nature and the environment, which leads to serious health problems, especially for the population in the region of Kaiserslautern. The Air Base Ramstein stands for militarism, armament and warfare both of the USA and NATO as well as of the German governmental politics to which we address our demands. We want peace and disarmament everywhere in the world! “For the many and not for the few”: For the people of this planet and against the profit of a small minority of arms and war profiteers. – End of drone warfare! Closure of the relay station at Air Base Ramstein. The end of the drone war would make the lives of millions of people on earth easier, better, more worth living, but it would not be the end of death and suffering through weapons and war. – For the closure of Air Base Ramstein together with a comprehensive conversion program that creates and secures civilian jobs. Overcoming the deadly activities of the Air Base will create meaningful jobs and a better quality of life for the people in the region. – The best way to bring Air Base Ramstein to an end is to terminate the agreement on the stay of foreign armed forces in the Federal Republic of Germany (often referred to as the troop deployment agreement). We demand from the Federal Government and the German Parliament: Terminate the treaty on the residence of foreign armed forces in the Federal Republic of Germany in accordance with the contractually agreed period of 24 months, so that all US and NATO military facilities on the territory of the Federal Republic are dissolved within two years – including the Ramstein war turntable with its drone relay station, EUCOM, AFRICOM, and the NATO command center in Kalkar as well as the US nuclear weapons storage sites in Büchel. In this way, the war policy of the USA, which is contrary to constitutional law and international law, is brought to an end from German soil. We got up and resisted the war logic of Air Base Ramstein – for more than four years with big, manifold, colorful, peaceful actions, the biggest actions in front of a military base in Germany! We have become a movement! – We must become even more: in the region and everywhere. – who are still hesitant to get involved or have withdrawn: join the protests in 2019, bring yourself into the various actions. It is about the future of all of us. – We are all concerned with the future of us all, who have been involved in this year’s impressive civil society actions, above all against racism and for solidarity with refugees, for climate protection and against coal mining, against the reduction of democracy through police laws and also in numerous peace actions, including the actions against Air Base Ramstein. Peace is not everything, but without peace everything is nothing. 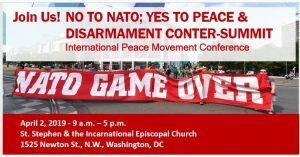 – demonstrate with us in Ramstein in June 2019 for our common goals. – comes to Ramstein and participate in the actions, in the camp, in the international anti-bases conference, in the big demonstration and in the actions of civil disobedience. 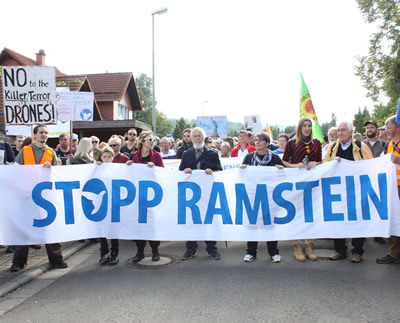 The protests around and at the Air Base Ramstein 2019 must set an unmistakable sign of peace! The times are serious.